Sakai Guides and DocumentationSakai Complete User Guide ForumsHow do I create a new forum? The Forum tool is organized by Forums, Topics, and Conversations. A Forum is a mandatory category or grouping for topics. There may be more than one Forum in the course or project site. Topics are required within Forums in order for site participants to be able to post, read, and reply to messages. Conversations are messages or threads of discussion posted within a Topic. This article covers the process for create a new Forum. Forums are useful for grouping several similar topics together, such as graded discussions, or group topics. They can also be used to specify the default topic settings for all topics within the forum. 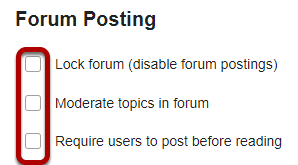 All new topics will inherit the forum settings by default. Select the Forums tool from the Tool Menu. By default, new sites are populated with a single forum titled after the name of the site, and containing one topic for General Discussion. The default forum and topic may be edited for posting messages, add more topics to the existing forum, or add a new forum. Click New Forum to add a new forum. Forum titles are required. Name the forum a title to easily identify the types of topics expected within it. Remember that users post messages within topics, not forums. Forums are a grouping or classification of topics. If desired, enter a description into the text box provided. The Short Description field only allows a maximum of 255 characters and does not allow formatting of text. This information is displayed to the user when they view the Forum tool. Zoom: Enter a detailed description. To provide more detailed instructions about the items in this forum, use the Description area to enter the information. This area includes the Rich Text Editor and allows for more advanced formatting options. Optionally, you may attach files to the forum. Click the Add attachments button to browse for and select a file. Lock forum: This option locks the forum so users can no longer post messages. However, they can continue to read existing messages. Moderate topics in forum: This option means all messages posted within topics in this forum, must be approved by the instructor before other students can see them. Tip: Setting open and close dates at the forum level can be tricky because individual topics may also have specified dates. However, the forum must be visible in order for the topics within the forum to be available to students. Typically, instructors set open/close dates at the topic level only. The default option is unchecked, allowing the user mark each post as read after reading. Selecting this option will mark all messages within a conversation, or thread, as read. When grading forum posts, select a specific gradebook item for the grades to be included in the Gradebook calculations. Note: You must first create the gradebook item in Gradebook tool before you can select it to be associated with a forum or topic. Tip: Similar to open/close dates, associating with the Gradebook at the forum level is not always ideal because individual topics may also be graded. Faculty may prefer to grade discussions at the topic level. 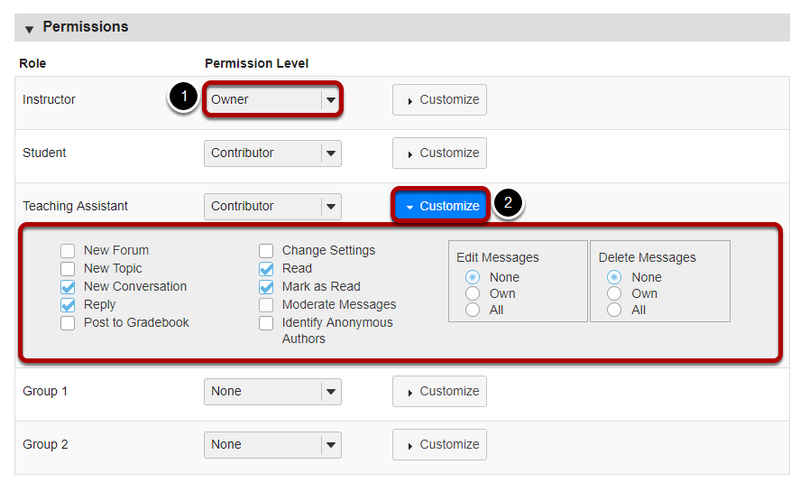 In most cases, the default forum permissions are appropriate. By default, instructors are forum Owners, and all other site participants are Contributors. The forum owner may add and delete topics, modify permissions, edit the forum and topic descriptions, etc. Contributors may only read, post and reply to messages. Prev: What is the Forums tool? Next: How do I add a new topic?